Each program contains a scheduler option which allows the user to schedule the program to generate records at a set specified frequency. The scheduler is optional so to enable it you must check the box beside 'Enable Scheduler'. The start date of your program is the date from which the first record will be created. elect the start date of your program. The user can specify how often they wish the program to be repeated. Repetitions can occur in scheduled intervals over Days, Weeks, Months or Years. This allows for virtually unlimited flexibility in how often the program may be repeated. The 'action notice' tells the system how many days before the due date that the system should create the record and notify the responsible person. The action notice will always be less than the repeat frequency. For example; If you wanted to calibrate a weighing scales every Friday and have the record generated on a Wednesday, you would set the start date to Friday, the repeat frequency to  [Week] and the action notice to  days. 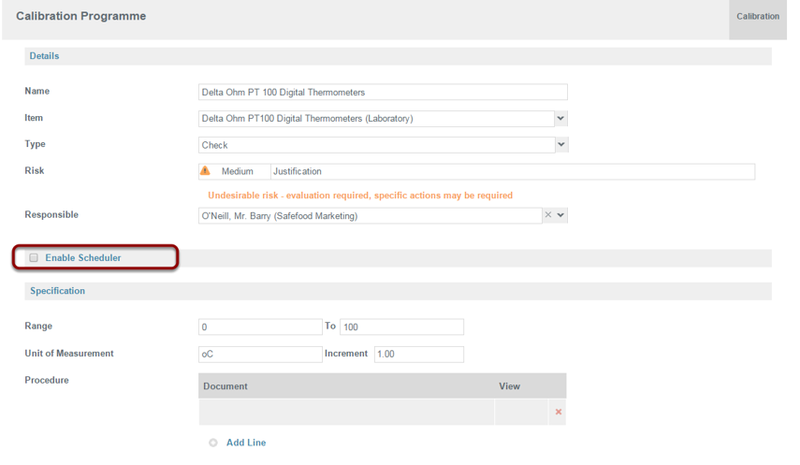 The user can choose to receive an email when the record is generated by the action notice. By selecting 'add line' they can opt to include other Safefood 360° users who can then log in to view the Action notice and take necessary action from there. The Plan tab allows the user monitor their programs. It displays the repeat frequency of the program, the last time the program was conducted, and the next due date for the program to be completed on or before.